A MLB World Select Travel Team was formed and will compete at the Arizona Fall Classic, a showcase format like event. 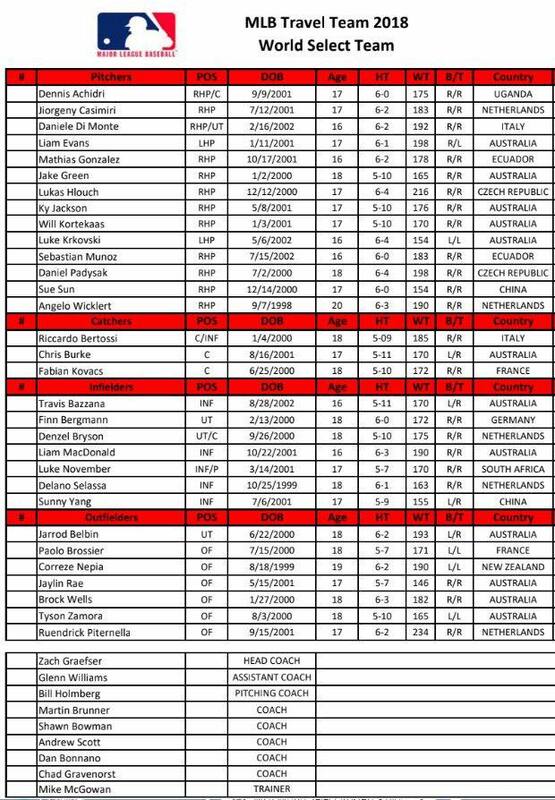 12 players from European Baseball got selected for the World Team, which is coached by Zach Graefser, Glenn Williams, Bill Holmberg, Martin Brunner, Shawn Bowman, Andrew Scott, Dan Bonnano and Chad Gravenorst. From the Netherlands pitchers Jiorgeny Casimiri and Angelo Wicklert, infielders Denzel Bryson and Delano Selassa and outfielder Ruendrick Piternella were invited. From Italy pitcher Daniele Di Monte and catcher Riccardo Bertossi are on the team, from the Czech Republic pitchers Lukas Hlouch and Daniel Padysak, from France catcher Fabian Kovacs and outfielder Paolo Brossier and from Germany infielder Finn Bergmann.